I am very experienced in taking care of elderly people. 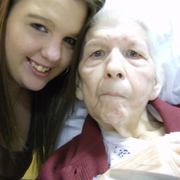 My grandmother was bed written and I took care of her from home, as well as stayed with her in the hospital. This included changing diapers, some physical therapy, helping get dressed. ect. I have experience with patients that have typically been in nursing homes, my grandmother suffered from strokes and was bed written, I learned how to help her bathe, get dressed cook for her ect. I am CPR Certified and I have had First aid training.